A deeper look at the grooves pressed into the 2017 vinyl reissue of Full Moon Fever by Tom Petty. 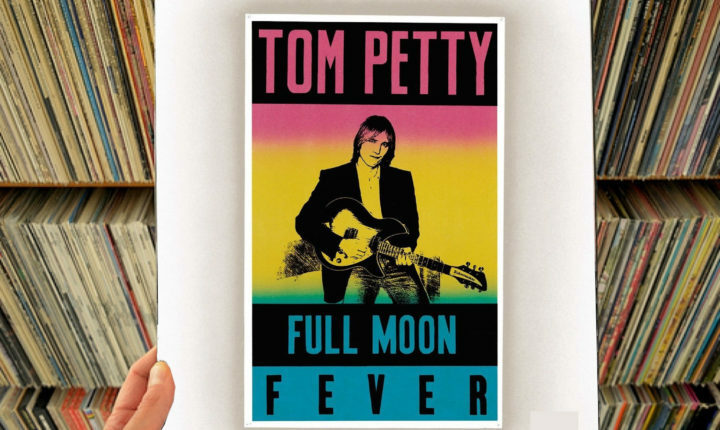 There’s no way to say for sure if the reason Tom Petty elected to launch his solo career with Full Moon Fever was because the singer felt like he had a surplus of songs that he didn’t want to bring to the Heartbreakers, or if he was just trying to make a point. If it was because he didn’t want to affix the Heartbreakers’ name to the album, he should probably have enlisted a group of players who weren’t in that group; they all play on Full Moon Fever, so that sort of knocks that possibility out of contention. So what might the point that he was trying to make have been? Why, that he deserved to play with other musicians on the level to which he had ascended by 1989; by then, Petty had already played in the allstar band The Travelling Wilburys, shared writing credits with the likes of Bob Dylan, George Harrison and Dave Stewart and shared the stage with rock royalty too – so maybe he felt like it was time to step up. If a solo album was released bearing his name and it tanked, the black mark would look all the worse because Petty had reached the level of a superstar, but shying away from such a potential challenge would have looked just as bad. Getting called ‘craven’ within a genre as gloriously headstrong as rock n’ roll is quite a heavy tag to try and carry, so once again Tom Petty damned the torpedoes and made his solo turn. And wouldn’t you know? Petty’s first solo album set a new precedent for quality in the singer’s songbook. True, Full Moon Fever played very similarly to the singer’s work with the Heartbreakers, but it does not play the same; it is bolder and more brazen, definitely. From the moment “Free Fallin’” gently and sweetly opens the A-side of the album, longtime Petty fans will know precisely what they’re hearing, and start to feel the adrenaline of that potential build. Images of classic Americana cut with cinematic delicacy (the good girl who’s crazy about Elvis, loves horses and her boyfriend are contrasted with images of the Hollywood Vampires and bad boys standing in the shadows don’t exactly align to tell a coherent story, but it is incredibly vivid) and sparkling rock guitars and spirit elevate the track into the stratosphere and no one who’s ears touch it will be able to resist; even upon first listen, all the elements of the song just line up perfectly and are the stuff which breeds lifelong love affairs within the hearts the song touches. The power of it is unbelievable. “Free Fallin’” sets the standard for Full Moon Fever very well and Petty clearly knew he was onto something when he wrote it – because he sets “Won’t Back Down” the second song on the album) up to play the same way; warm and strong with just enough vaguery between the verses (come on – “I won’t back down, no I won’t back down/ You can stand me up at the gates of hell/ But I won’t back down” doesn’t say much other than issuing a statement of defiance, but it sounds pretty good in the moment), listeners are able to add a bit of themselves to the song and make it feel as important and prescient as they choose. It’s kind of brilliant in that regard, and the singer wisely keeps the song as simple and direct (read: no impressive soloing or histrionics, just musical meat and potatoes) to make sure listeners’ attention won’t be diverted or distracted throughout its less-than-three-minute runtime. “Won’t Back Down” is, very simply, pop rock at its finest. As Full Moon Fever‘s A-side progresses, Petty does stretch some of the boundaries he has set with its first two cuts (“Love Is A Long Road” entwines The Who’s perception of guitar rock with Petty’s own grasp of Eighties pop values while “A Face In The Crowd” eases off the throttle to try and find that girl who was there and gone in a flash and lets the singer play around with/against his typical authoritative voice before “Runnin’ Down A Dream” finds some classic fuel to burn, roads to drive and dynamics to turn platinum before the side runs out. Some critics may scoff and say that the manner by which these songs are presented draws a pretty soft difference between Petty’s music with the Heartbreakers he’s doing alone here, but they’ve somehow missed the point; where the Heartbreakers use a palette which includes folk, rock, blues, pop and several other styles to paint their canvas, Petty uses rock exclusively here – and makes it taste just as good and filling as any sonic combination platter..
Where the A-side of Full Moon Fever utilizes rock to get its point across exclusively for listeners, the B-side goes out of its way to slow things down and really connect with them. Both “Feel A Whole Lot Better” and “Yer So Bad” show that, when Petty was working with George Harrison while making The Travelling Wilburys’ first album, he was taking very good notes indeed while “Apartment Song” chases a Replacements vibe with an equal parts rock-and-pop arrangement and “A Mind With a Heart of its Own” gets some perfect (and perfectly coy) examination of emotional injury in before the side closes. In this particular case, that the album’s B-side does play a little more methodically proves not to hinder the running of it at all; rather, that slower movement makes it possible for listeners to really get inside the singer’s craft and inhabit it outside of the context of a Heartbreakers album, and it’s quickly apparent that, while different, nothing about Full Moon Fever is lacking. The new, fortieth anniversary vinyl reissue of Full Moon Fever is out now. Buy it here on Amazon.